This Slow Cooker Chicken Parmesan Soup is a kid friendly crockpot recipe that the adults will love too. 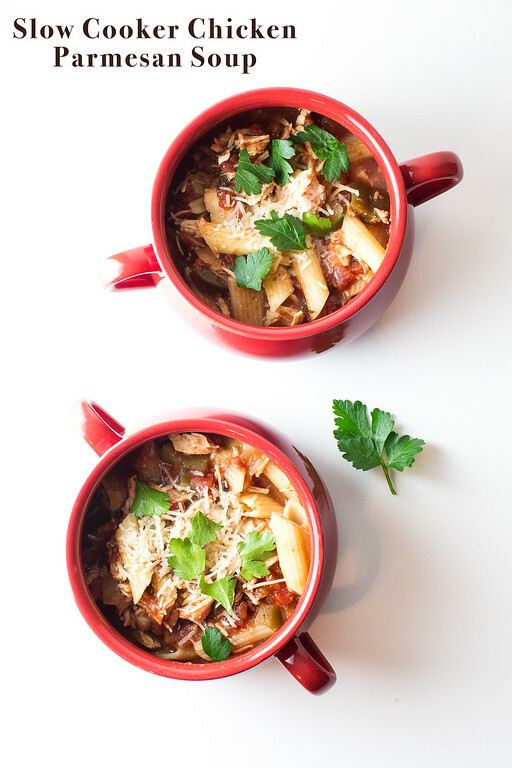 It’s an easy Slow Cooker chicken soup, even the pasta cooks in the slow cooker! I have a confession, most of my soups that I make in the slow cooker are a bit broth heavy. Not that there is anything wrong with that. I love a good soup broth. Sometimes I eat all the solids of the soup, just so I can savor the broth all by itself. 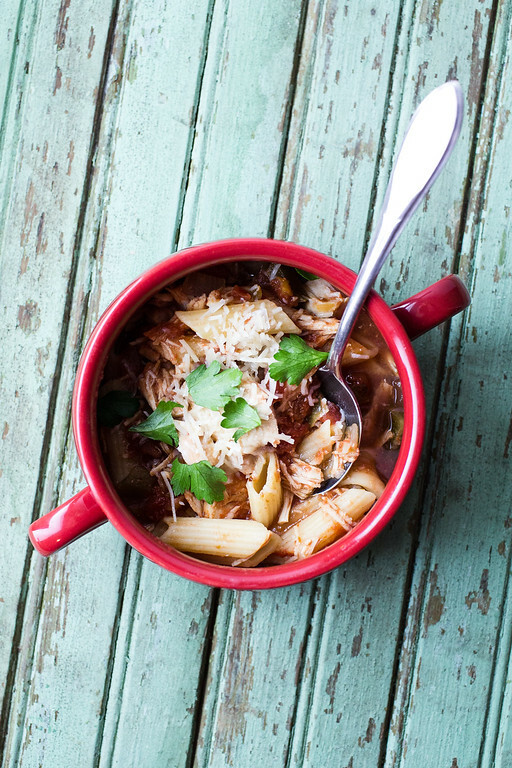 However this Slow Cooker Chicken Parmesan Soup that I found at Food52 might just change my mind. In their description they talk about how this soup has all the flavor of a decadent chicken parmesan served over pasta, but that it’s much more waist friendly. Boneless, skinless chicken breasts simmer away in chicken broth with tomatoes, green bell pepper, garlic, onions and herbs. Later, you simply remove the chicken and shred it, return it to the slow cooker. Then you add the pasta and cook on high for about 30 minutes. All easy, peasy. I had no idea that you could cook pasta in the slow cooker. I remember all the old recipes would have you cook the pasta separately and then stir it in at the end. True, you wouldn’t want your pasta in their for the full 7-8 hours, but adding it at the end like this, letting it cook in the flavorful broth is perfect! I’m going to go on record here stating that this Slow Cooker Chicken Parmesan Soup is definitely in my top 5 slow cooker recipes. It is so rich and creamy. A little bit of heat from the red pepper flakes and some nuttiness from the Parmesan cheese. Perfect. This Slow Cooker Chicken Parmesan Soup is so easy! Even the pasta cooks in the slow cooker! Place the garlic, bell pepper, tomatoes, chicken, chicken broth, onion, cheese, basil, oregano and red pepper flakes in the slow cooker. Cover and cook on low for 7-8 hours. Remove the chicken breasts and shred with two forks. Return the chicken to the slow cooker and stir in the pasta. Turn the heat to high and cook for 30 more minutes or until the pasta is cooked to your liking. Serve garnished with some additional Parmesan cheese and fresh basil or parsley. Absolutely delicious! 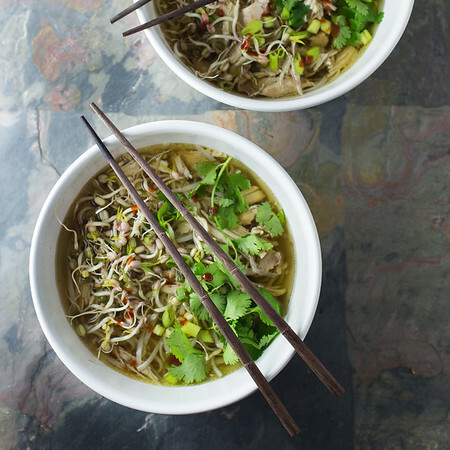 This is a hearty, tasty soup that is easy to put together. I made it a few weeks ago. I’m glad I made a double batch. We both had seconds at dinner and I froze the leftovers. It was just as good from the freezer. I’ll be making this often! So glad you liked it!! It’s one of my favorites! Oh my – I eat my soup the other way around. The broth first and then the solids. I love soups made in the slow cooker and will be giving this a try. Sounds yummy! Thanks for linking up with Merry Monday! If it made your Top 5, it must be good! Looks like true comfort food. I went ahead and linked you up at Souper Sundays since I saw it noted on your list of links. 😉 Thanks for sharing! 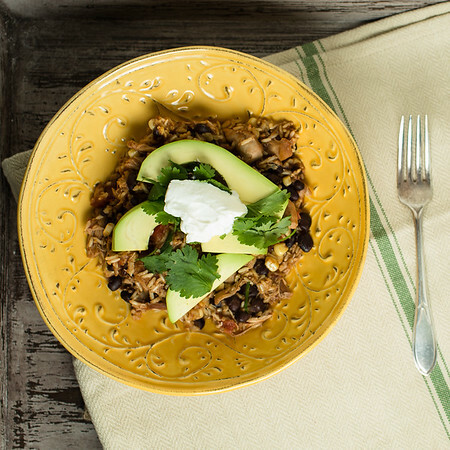 This looks like comfort in a pot! I LOVE that the chicken doesn’t have to have 27 things done to it before it ever sees the pot! 😉 Thanks for sharing…stopping by from Wonderful Wednesday! P.S. Love that Pavarotti quote…one of my favorites about food and eating! This sounds absolutely amazing -I can’t wait to try it! Chicken parm is one of my favorite foods. Thanks for sharing it sounds delicious!!!!! Looks delicious. We had a cold weekend here, and soup is perfect for that kind of weather. This sounds delicious! And your photos are stunning. 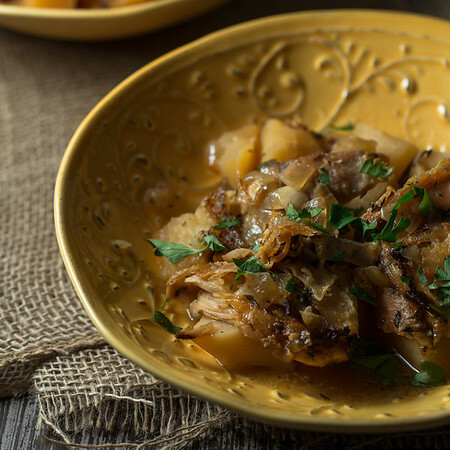 I am making this one, good recipe that u can use the slow cooker. Happy you posted it!